Our Tuesday Tip…if you are experiencing difficult handling, a rough ride, a vibration or poor performance, these are symptoms that you can feel. They almost always indicate problem of some sort. Misaligned front wheels and/or worn steering components, such as the idler arm or ball joint, can cause wandering or difficulty steering in a straight line. Pulling – the vehicles tendency to steer to the left of right – can be caused by something as routine as under-inflated tires, or as serious as a damaged or misaligned front end. Worn shock absorbers or other suspension components – or improper tire inflation – can contribute to poor cornering. While there is no hard and fast rule about when to replace shock absorbers or struts, try this test: bounce the vehicle up and down hard at each wheel and then let go. See how many times the vehicle bounces Weak shocks will allow the vehicle to bounce twice or more. We recommend replacing shocks at 65,000 miles and struts at 75,000 miles. 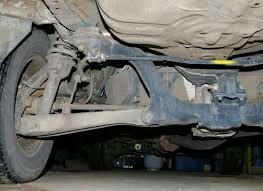 Springs do not normally wer out and do not need replacement unless one corner of the vehicle is lower than the others. Overloading your vehicle can damage the springs. Balance Tires properly. An unbalanced or improperly balanced tire causes a vehicle to vibrate and may wear steering and suspension component prematurely.